BATC has conducted robust testing of OLI performance in accordance with their proposal and contract. These prelaunch tests indicate that OLI performance meets specification with requirements exceeded in most cases. Fig. 3 and Fig. 4, for example, show SNRs derived from data collected by the OLI while illuminated by known spectral radiance from an integrating sphere traceable to National Institute of Standards and Technology sources. The OLI was operating within a thermal-vacuum chamber in a space-like environment when the data were collected. 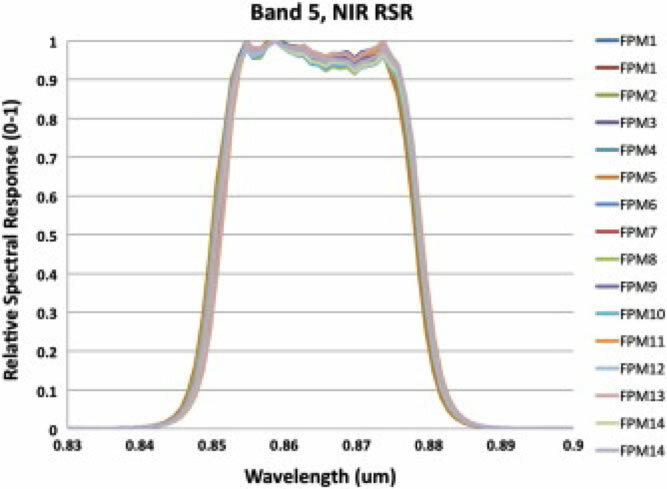 The observed SNRs are substantially greater than the required SNRs for all spectral bands at both typical, Ltyp, and high, Lhigh, levels of spectral radiance. Fig. 3. OLI prelaunch signal-to-noise ratio (SNR) performance at Ltyp. Red bars show measured SNR, blue bars show required SNR. Fig. 4. OLI prelaunch signal-to-noise ratio (SNR) performance at Lhigh. Red bars show measured SNR, blue bars show required SNR. As another example, Fig. 5 shows relative spectral response curves for OLI band 5, the near-infrared band, for each of the focal plane modules. The test data were collected with the OLI in the thermal-vacuum chamber and illuminated by narrow-band radiation from a double-monochrometer. The plot indicates that the OLI meets band 5 specifications for band width, band center, spectral flatness, and spectral uniformity across the focal plane. Test data show that these specifications were met for all of the spectral bands. Fig. 5. Relative spectral response curves for each OLI Band 5 focal plane module (FPM).